How is 由此 (yóucǐ) = “herefrom” used? 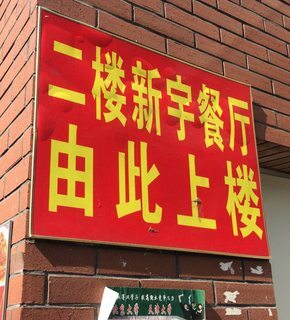 I see this sign near one of the cafeterias at Nankai University. Where 新宇 (xīnyǔ; Sinew) is the company name. I'm interested in 由此上楼, and particularly how 由此 is being used. I guess it makes sense, effectively meaning "go upstairs here", although I would expect some combination of 这里 (zhèlǐ; here） and 上楼 (shànglóu; go upstairs) to work. The question Are there any online resources for learning Chinese 4-character idioms and its top answer makes me think it might be something special. Question: How is 由此 used? It seems to be quite different usage to 由此上楼, however. You may go upstairs (to another place) from here. 由 means "from" or "by" here, 此 means "this" or "these". When would 产生了 be used? Why is 的 used in these sentences? Why is 未有 used here? How is 还 used with adjectives? How was 辣 used before the Columbian Exchange? Why is 了 used in this context? How is 眷顾 used in spoken Chinese? How do the words in 让我不断想不敢再忘记你 piece together (from the song Mouse Loves Rice, 老鼠爱大米)?